Initially, it was a challenge to find the best home school curriculum for our sons' learning styles although we already had five daughters. I remember when we didn’t have any boys and people would say things like, "Boys are different from girls." I was always polite but never really believed them. I figured how could a boy be that different from his female counterpart. So, finding the best home school curriculum for them wouldn't be any different than it was with the girls. After all, children are children, right? Wrong! I was about to discover how different it would be to find the best home school curriculum for them. In 1996, our son, Isaiah Evan, was born. Now, I would get my chance to quiet all the "nay-sayers" who wanted to convince me that boys are different from girls. He started out just like all my other children; he nursed, cooed a little, and slept most of the time. Then, we saw something different. As he became older, about a toddler or so, he started to do things our daughters had never done. He was much louder and more physical than they ever were. The same toys we had from the girls became "weapons" or sticks to be used on his makeshift drums. It was happening right before my eyes. He was becoming a different type of child than what I had been accustomed to seeing in my home. 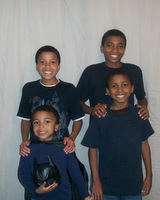 Again in 1998, 2000, and 2004 we had more sons bringing our total to four and ten children in all. Now, I had to determine how to homeschool these little people who differed from their siblings. Number One - Probably, the biggest difference between the boys from the girls was their level of activity. I had experienced really "mellow" daughters who were very easy and willing to learn. Now, I had boys who were rambunctious and full of energy. Number Two - Another difference was in the type of reading material they were interested in. They didn't enjoy the Little House series as our daughters did so I had to find the best home school curriculum for them with stories about boys and their antics, to hold their attention. Also, I had to get accustomed to them doing things while I read rather than just sitting quietly and listening as our daughters did from an early age. Number Three – They possess higher levels of testosterone, the male hormone, and are more physical and competitive. So, I used that and encouraged mild competitions between those closest in ages and grade levels. It worked wonderfully as they were always trying to outdo the other person. Number Four – Our boys have not been avid readers and writers like their sisters. So, I have had to adapt and let them read and write about topics of interest to them. They also enjoyed being read to more often than our daughters who preferred to read for themselves. And, when my husband required them to read their Bibles daily for forty-five minutes, I saw an increase in their abilities. Number Five – Our boys are more expressive which makes them more extroverted and talkative. They enjoy being with others and are great at discussing topics rather than writing about them. This has led to some phenomenal interaction during Bible and history lessons with them. For math I have found Math-U-See to be the best home school curriculum for our boys because the transition from Legos to MUS blocks was a very easy one. I also had to be willing to give them ample time to "manipulate" the blocks during our math lesson. I use Daily Grams for grammar and it goes pretty well with all of my sons. They enjoy the brief lessons and when I teach two of them together, they can compete to see who forms the best sounding sentence when we do the sentence combining exercises. I teach history with Mystery of History in a group setting and we talk a lot and even have hot chocolate or a snack during our discussions. They enjoy the projects and we do creative things like lapbooks, too. They like it best when I provide the templates for them to complete, though. Our science lessons are done twice a week and always include a hands-on activity. I create my own unit study topics according to their interests and require daily reading in their grade level Bob Jones Science books. I also bring home armloads of colorful, interesting books from the library at the start of each new unit. When we do our Bible devotions, I use a terrific little book from Wallbuilders called Bible Study Course which we use as a guide. There is one for the New Testament and another for the Old. Again, we might sip our hot chocolate, which we love, and read the Bible and discuss the lesson. They prefer to be quizzed orally on the facts and Bible verses. I hope that sharing what we do in our family has been helpful to others. I think it is very important to understand how boys are different from girls so we can teach them differently. Since I have discovered these differences, I have had to adapt my teaching style and homeschool curriculum, at times. I don't try to simply reuse the material used with the girls and hope my boys will be alright with it. Now, I approach my curriculum searches in a totally different way to try to find the best home school curriculum for our boys. Have you had challenges finding the right materials to keep your son's interest? What have YOU found that works? We would love to hear from you.